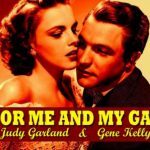 For Me and My Gal is a good many things — an ode to vaudeville, with some excellent song and dance routines, a “boy meets girl” movie, the film debut of Gene Kelly, a patriotic movie — and a very good movie overall. Frankly, what’s most refreshing about For Me and My Gal is that the protagonist is a flawed person. His flaws lead to his problems, and whose overcoming them leads to character growth. ﻿ Gene Kelly makes his film debut in this WWI musical playing a man who starts a vaudeville act with a young woman and they become determined to play The Palace. He deliberately injures his hand to avoid being drafted into the army, in order to have that shot. It’s not that he’s a coward, or unpatriotic. He’s simply too focused on that goal to see what’s staring him in the face. 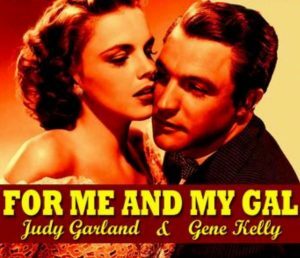 Pack up your troubles and go on the road with Judy Garland and Gene Kelly in his screen debut of this 1940 Busby Berkeley directed tale FOR ME AND MY GAL. After a late-night cup of coffee, vaudevillians Jo Hayden (Judy Garland) and Harry Palmer (Gene Kelly) sit at a piano and work on a song. Moments later, Jo realizes she’s found exactly what she wasn’t looking for in a partner. Kelly and Garland dazzle as the song-and-dance pair who take on tank towns, tough times and World War I while struggling for show-biz success. A hit parade of era tunes grace the film, including the wowser BALLIN’ THE JACK and the sweetly harmonized title song. Bursting with vitality and old-fashioned charm, FOR ME AND MY GAL is a treat for the ages.